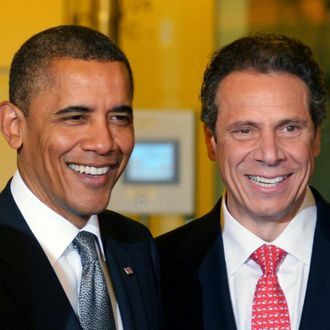 Don’t get it twisted, Andrew Cuomo insisted yesterday, because last-minute national appearances for Barack Obama do not mean the New York governor is running for president in 2016. “I’ll do whatever they ask me to do,” said the very popular, bipartisan Cuomo, who will travel to swing states in support of the president’s reelection. “But I don’t want to step over a line that could fuel potential speculation of, ‘Well, Cuomo’s looking to run in 2016,’ you know?” Oh, we know. But still! Cuomo has maintained an extremely low-profile so far this election cycle, even requesting a mere cameo at the Democratic National Convention. He’s no Chris Christie. “I want to make clear,” he stressed. “What I’m doing, I’m doing as a surrogate, a responsible surrogate for President Obama.” Any national recognition that results is pure coincidence.